Diverse application - wet & dry batter. Reduces complexity of marination - save up to 50% of kitchen time. Consistent flavor and crispiness of coating. 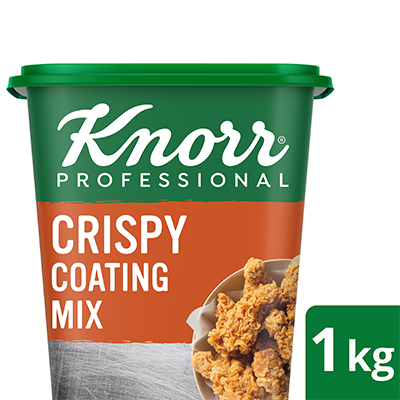 Knorr Coating Mix is used to marinade and coat chicken for delicious, crispy and flaky coating after frying. • Marinate 1 Kg meat in 30 gms of Knorr Spicy Marinade and leave for 2 hours. • Add 28 gms (2 Tbsp) of Knorr Coating Base (seasoning for flour) in approx 372 gms plain flour for coating. • Heat oil up to 160°C. Coat marinated chicken in dry flour mix and then dip in cold water for 10 seconds. • Coat the chicken again in dry flour mix. Deep fry chicken pieces in pre heated oil till it's golden brown. Serve hot. • Adjust spice with Knorr Spicy Marinade as desired. To keep the fried chicken crispy for long time, keep every piece on rack with little distance from each other. Add crushed chilli in marinade to make your chicken spicier.